The Iowa DOT TAMP – FHWA Iowa Division Informal Review is available here. 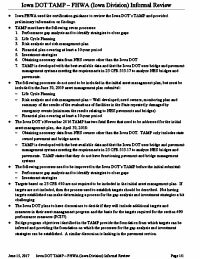 Minutes summarizing FHWA Iowa Division comments on the Draft Iowa DOT TAMP. These comments were received in June, 2017. The Draft Iowa DOT TAMP is available on this site at: http://www.tamptemplate.org/tamp/031_iowadot/. The modal scope of this document is: . The asset scope of this document is: .